Without HISTA’s breakdown of households by tenure, income, household size and age it is extremely difficult to calculate demand for housing with any precision. Simply applying tenure rates and household size ratios to standard household income data will likely produce incorrect numbers for specific target groups. HISTA produces considerably more accurate results as it is based on an ACTUAL CROSS TABULATION of Census (ACS) data that breaks down this information at its source – it is NOT compiled using ratios and interpolations. The chart show calculations based on the exact same source of data – ACS data. The HISTA numbers are from the ACS cross tabulation, the conventional numbers are ACS household income with ACS tenure and household size ratios applied. 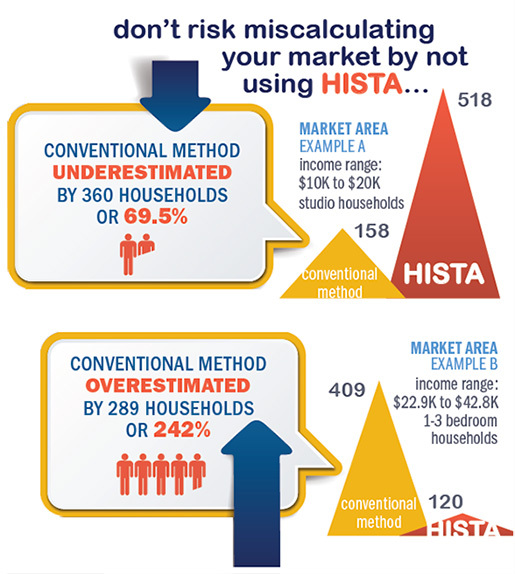 HISTA is a custom four-way cross tabulation of household data designed specifically by housing market analysts for housing market analysis. The basis for HISTA is a custom cross tabulation of ACS data prepared specifically for Ribbon Demographics by the US Census Bureau. The finished product with current year estimates and five-year projections is built by Claritas, a leading provider of demographic data worldwide. Claritas’s team of demographic experts work hard to develop the most reliable numbers possible. HISTA is available for Census Tracts, Census Places, ZIP Codes, Counties and CBSAs throughout the nation, allowing for a precise calculation of demand for specific areas. HISTA is only available through Ribbon Demographics.